Nazis Splitting With Kiev Regime? …the leader of the ultra-nationalist Right Sector threatened to withdraw volunteers fighting on the government side. Dmytro Yarosh said Right Sector would launch a “campaign in Kiev” if its demands, including the release of detained members, were not met within 48 hours. He called on President Petro Poroshenko to “immediately bring order” to the Interior Ministry, which he accused of harbouring “revanchist forces”. 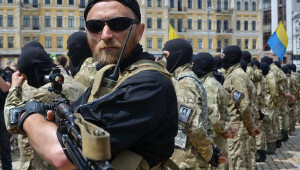 For Right Sector’s threats of withdrawing support from Kiev to have any meaning, a significant number of Nazi militants would have to be fighting under the banner of Right Sector in the first place, contradicting months of claims across Western media claiming otherwise. Ukraine’s government seems to have made a devil’s bargain, by allowing the formation of loosely-controlled paramilitary groups to fight in the country’s east. That some of these volunteers are ultranationalists, far-right extremists and sometimes even neo-Nazis seemed to be worth the gamble. Anyone who was willing to risk his life to defend Ukraine at this critical juncture was welcome. Despite the BBC’s attempts to portray the prevalence of Nazism as insignificant among forces fighting on behalf of the NATO-backed regime, Right Sector and the Azov Battalion are not apparitions. Rather, they are a representation of both the ultra-right Nazism that pervaded and indeed led the “Euromaidan,” and the “volunteers” lining the ranks of Kiev’s militant forces fighting now in eastern Ukraine. The problem with lining one’s military forces with Nazis is that the general public will eventually begin to notice. 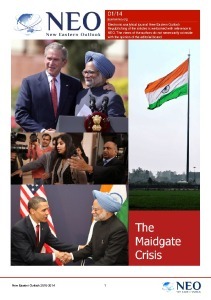 Upon noticing, the Western media appears to have begun a two-pronged strategy. First they are doing precisely what the BBC above is doing – playing down the significance of entire battalions of Nazis fighting in eastern Ukraine on behalf of Kiev. Second, is the possibility that there is no falling out at all between Kiev and Right Sector and this recent development is instead an attempt to distance literal armed Nazis fighting in the east from their political fronts back west. The need for Kiev to maintain plausible deniability is multifaceted. In order to continue receiving financing, arms, political, and even military support from NATO, the regime must do whatever it can to portray its struggle as the “defense of Ukraine’s territorial integrity” rather than ideological-driven, Nazi-inspired ethnic cleansing. There is also the increasing brutality of Kiev’s military operations in eastern Ukraine to contend with. The ability to blame the worst atrocities on Nazis that have publicly “broken ties” with Kiev would be a convenient and useful tool to manage public perception both inside Ukraine and internationally. In the coming days and weeks, the veracity of these claims of Right Sector breaking away from Kiev will soon be known – as will the nature of the ploy should Right Sector not make good on its threats. Anything short of Right Sector carrying out completely its threats against the regime in Kiev will indicate that indeed this was feigned to maintain plausible deniability between Kiev and the Nazi forces carrying out atrocities in eastern Ukraine on its behalf. Should Right Sector begin a campaign of destructive infighting centered around Kiev, these initials reports will indeed prove plausible. If Right Sector does not withdraw its forces from eastern Ukraine, and maintains merely rhetorical attacks on Kiev, it will indicate this is yet another attempt to manipulate public perception and mitigate otherwise untenable and indefensible policy both in Kiev, and among the Western nations backing the regime. There is the possibility that Right Sector, or at least part of it, is at odds with Kiev. But Right Sector is not the only militant front espousing Nazism. As mentioned before, there is also the Azov Battalion, and many more for Kiev to arm and send east. 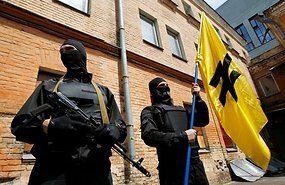 Whether the development is feigned, or Kiev is indeed collapsing in a mess of infighting against Right Sector, the recent development indicates that Nazi militants do indeed constitute a significant amount of the fighters going east to conduct armed military operations against fellow Ukrainians. Whether there are so many Nazis fighting east that Kiev decided to create a political ploy to create “distance” between itself and the forces fighting on its behalf, or one of its Nazi militant wings is in fact turning on it, and threatening Kiev’s grip on power – the Nazi menace the Western media has worked so hard to hide is now coming out into the open. Clearly, what was deemed “Kremlin propaganda” for months, has turned out to be verified truth. Those armed elements waving Nazis flags in the middle of Kiev during the “Euromaidan,” seizing political opposition offices, defacing them with Nazi symbology, and expelling their opponents from power through force and intimidation, are now heavily armed with military hardware and killing in eastern Ukraine. As the BBC attempts to create a narrative to explain how those in good conscience could possibly align themselves with the toxic ideology of Adolf Hitler and his Nazi legions, the world bears witness to a global order once again aligning itself with the absolute worst of humanity while simultaneously claiming it is fighting for what is absolutely best. 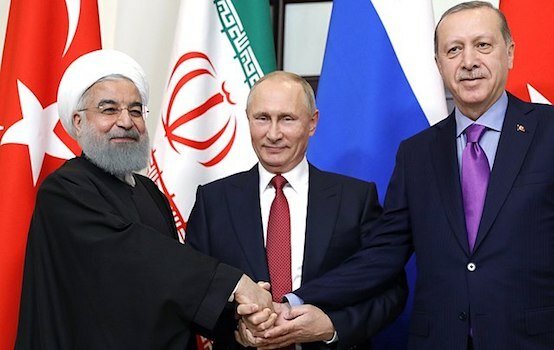 From backing Al Qaeda across the Muslim World, to backing Nazis in Eastern Europe, it would appear that the West, not Russia, constitutes the gravest threat to global stability, peace, and prosperity. While symbolic, politically-convenient bombings are conducted against terrorist hordes in Iraq even as billions flow into the hands of the same terrorists on the other side of the border in Syria, and Right Sector Nazis threaten to march on Kiev, the vector sum of the West and its various proxies around the globe is a march toward regression, tragedy, and greater conflict.